Dear mummy, thank you so much for taking me down to Brighton over the weekend. 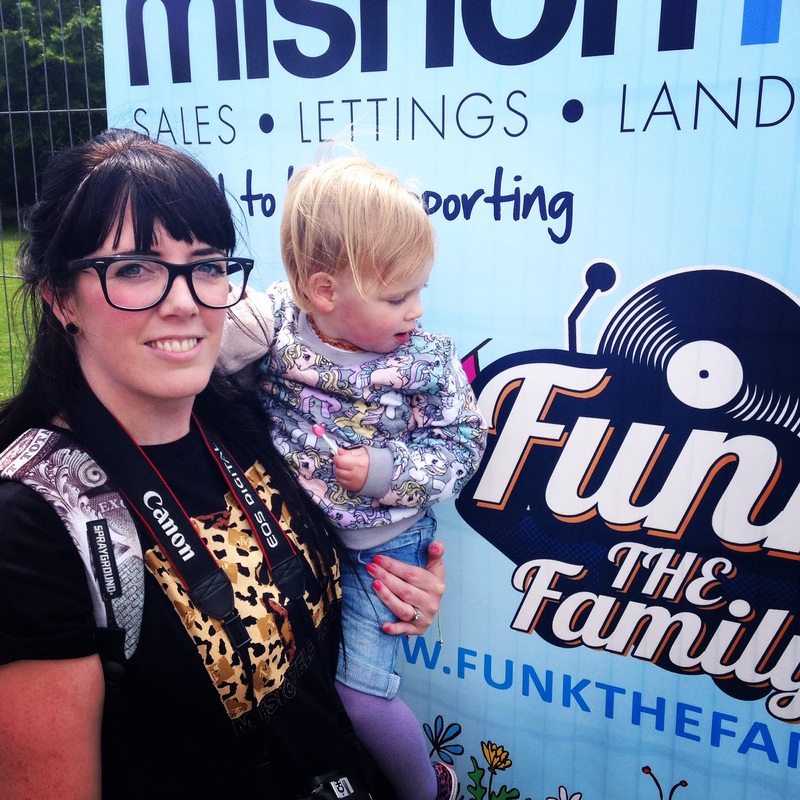 We visited Funk the Family Festival in Hove, a one-day music festival and had a great time. The weather helped as it was such a sunny day! We arrived after an hour journey through M25 traffic and parked in Hove City Centre. 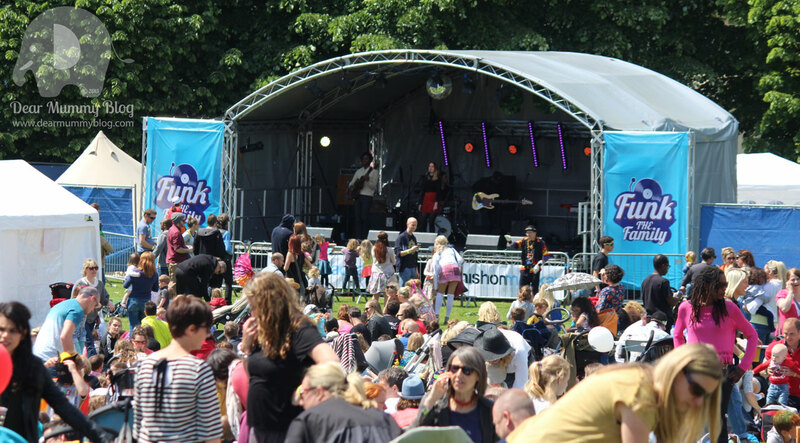 Funk the Family Festival 2015 was based at Hove Park, in a residential area and there wasn’t any long stay parking available nearby. So we parked a mile away in Norton multi-storey car park, 6hrs for £4.70 which was the cheapest around we could find. It was quite a walk to the festival though!! Which took us 30 minutes with a toddler in tow. 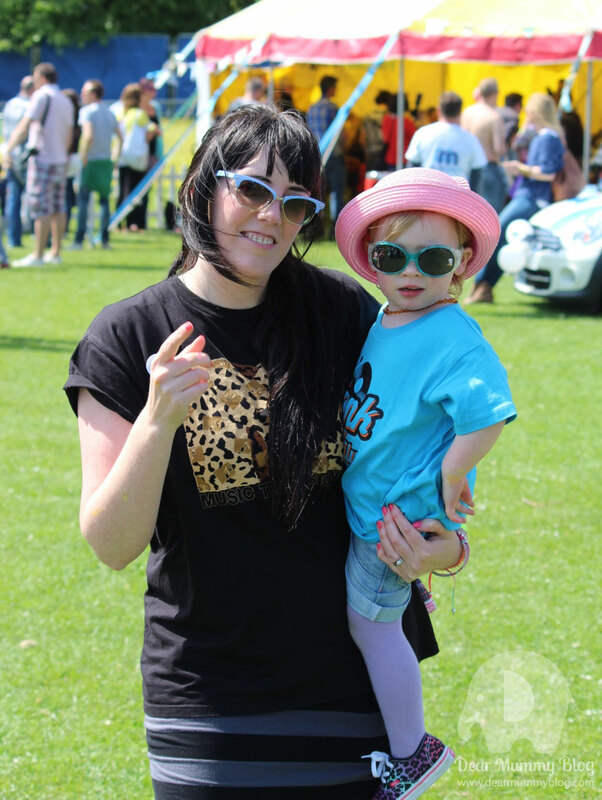 We could hear the music getting louder and louder as we walked towards the site, the festival was in full swing! 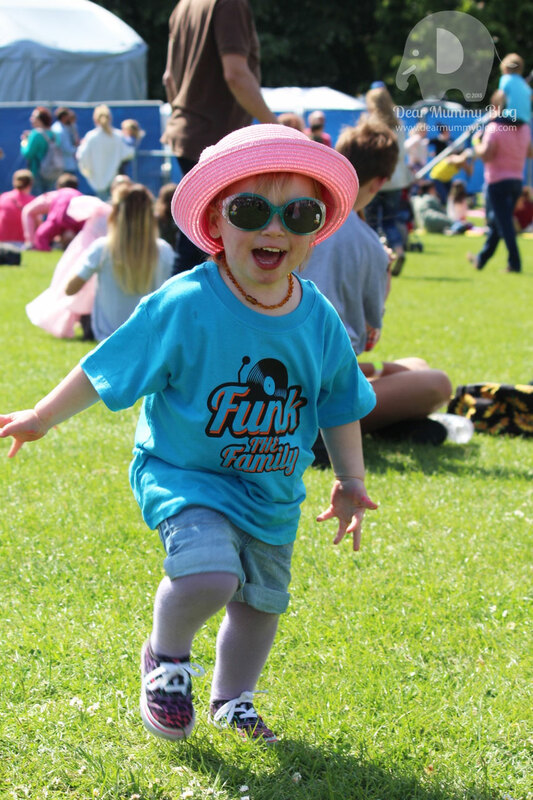 By the time we got to the Funk the Family festival queue (which was short and quick thankfully) we were frazzled and in a desperate need to sit down. There were no maps around so we just headed for the main stage to get our bearings. It was lunch time, so we found a spot with our picnic blanket next to Lucy’s Little Forest School, on top of a slight hill so we could see the whole site while we had lunch. There were so many food options available from gourmet burgers to curry or stone baked pizza and yummy burritos it took us ages to decide! 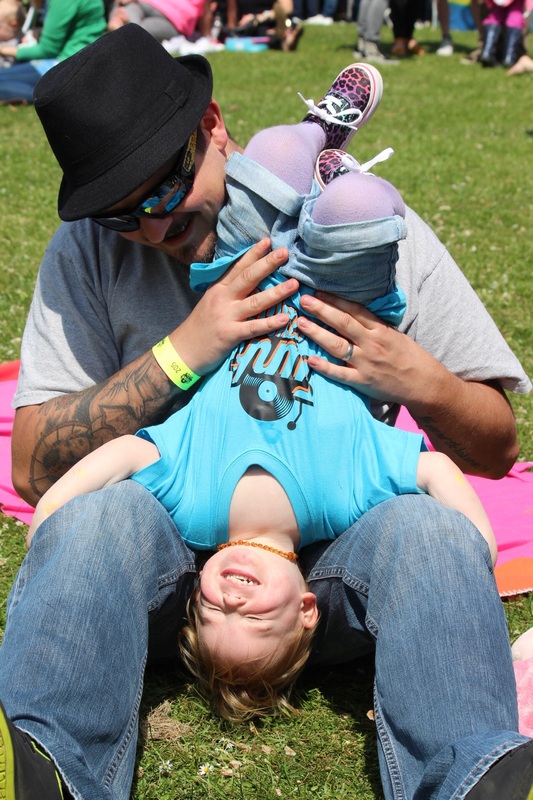 We enjoyed a fresh pizza and sat in the sun and soaked up the atmosphere. 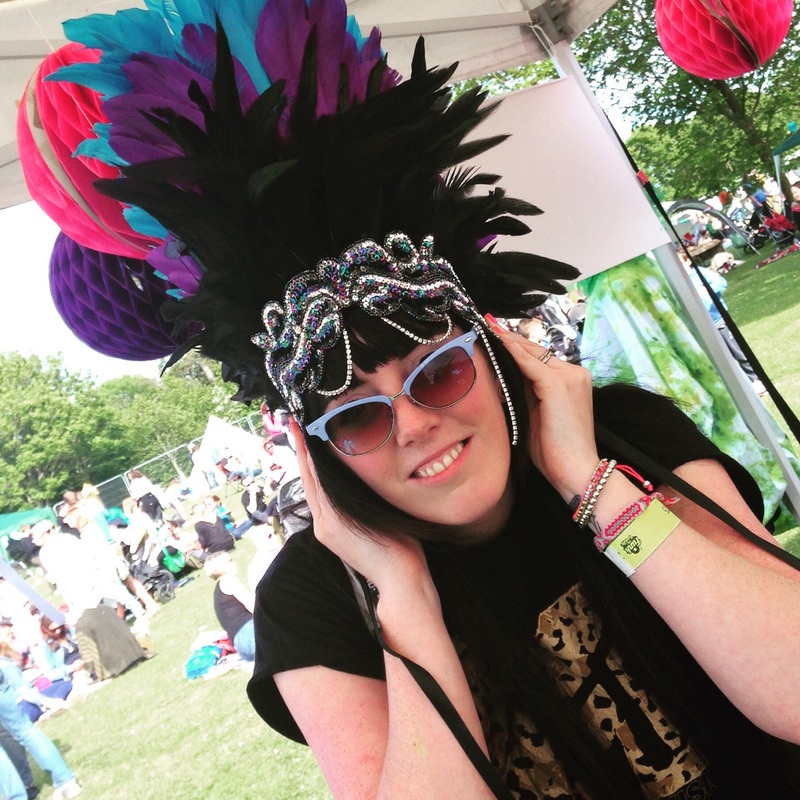 We could hear the thumping music coming from the Club Tropicana DJ Bar near the entrance and the live music coming from the Main Stage. 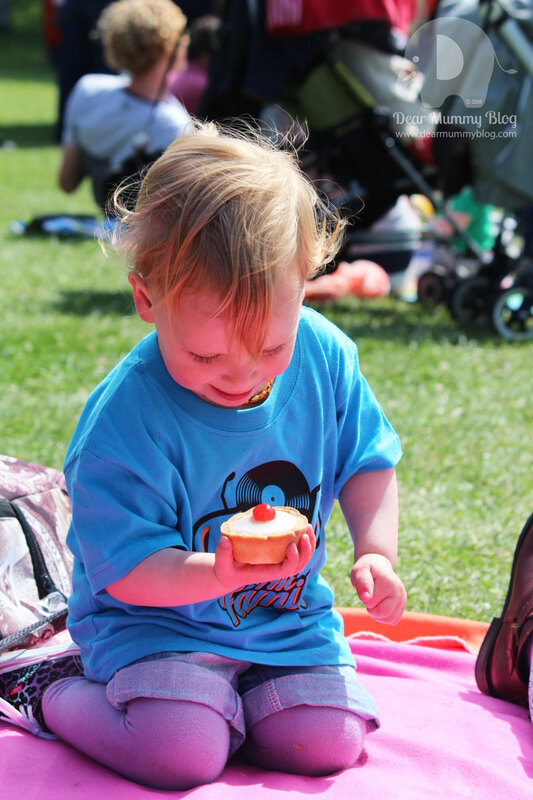 The grassy field was a sea of people, picnic blankets and pushchairs. 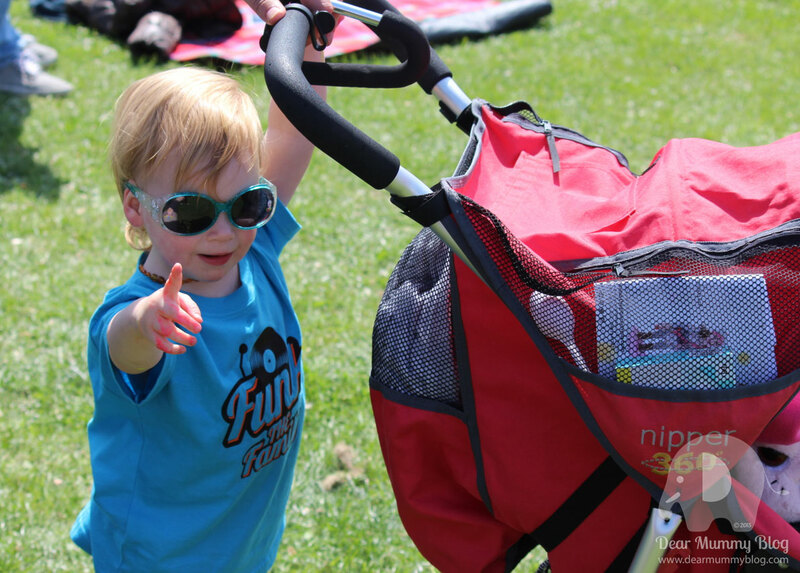 A lot of parents were sunbathing and letting their hair down, while little people roamed around them wearing bright orange wristbands with contact numbers on incase they went missing. It was a very safe environment and security and staff were on-hand and very visible which was reassuring. After we had lunch we explored the site, the majority of the food stalls were on the left side of the festival’s main stage and the activities were on the right side, with a scattering of festival craft/fashion stalls in the middle. It would have been good to have a programme to take with us or maps up around the site. Luckily it was small enough to see the majority of tents around. Unfortunately we missed the Vintage Caravan Photo Booth and didn’t discover it until it was time to go home. A map would have helped with that. 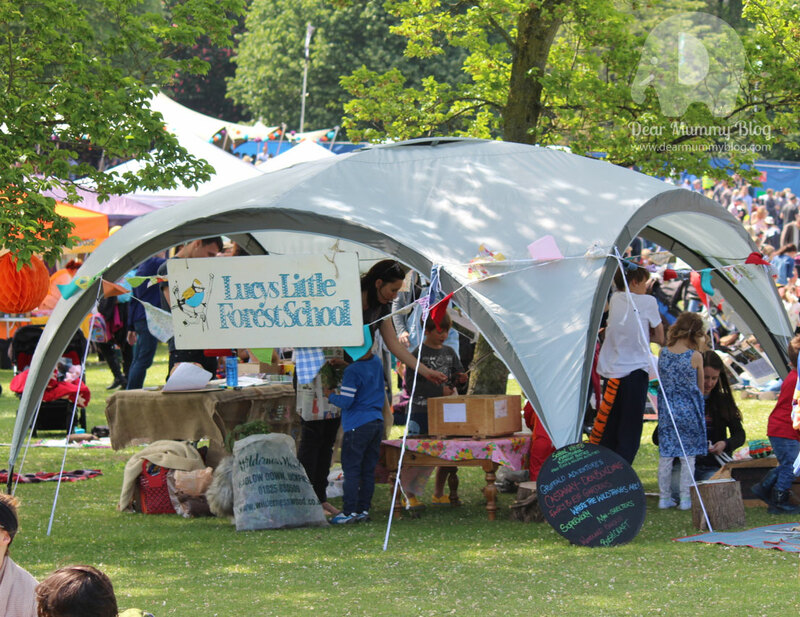 We didn’t make it around to all of the activities but our favourites were Lucy’s Little Forest School where we played with clay and made a forest sculpture. We watched other children make recycled art out of plastic shopping bags too which was a good up-cycling technique. 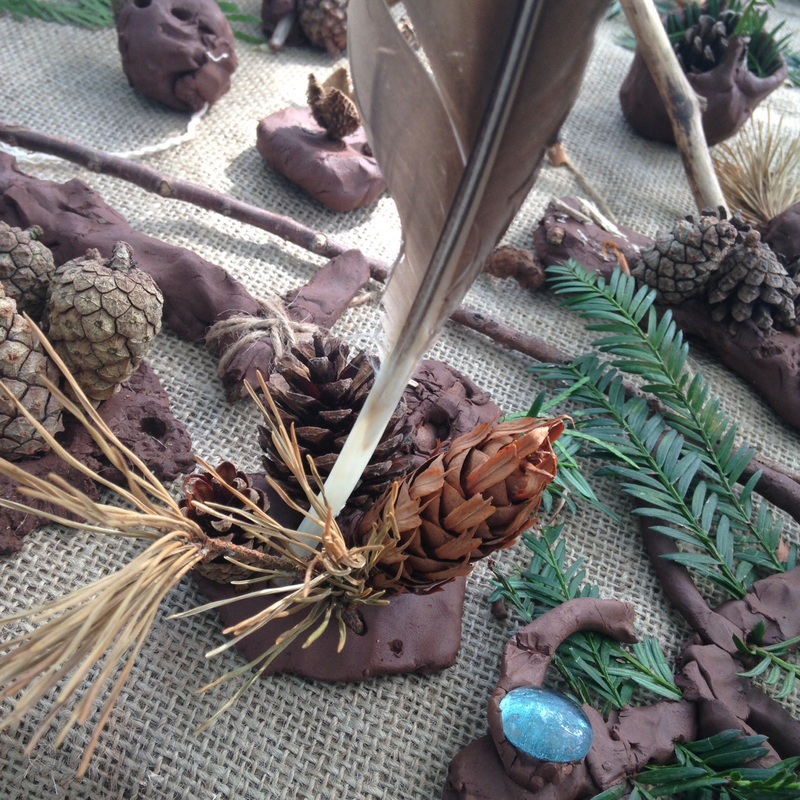 I enjoyed sticking my pine combs and feathers in the clay and it was a great souvenir of the day to take home with me. 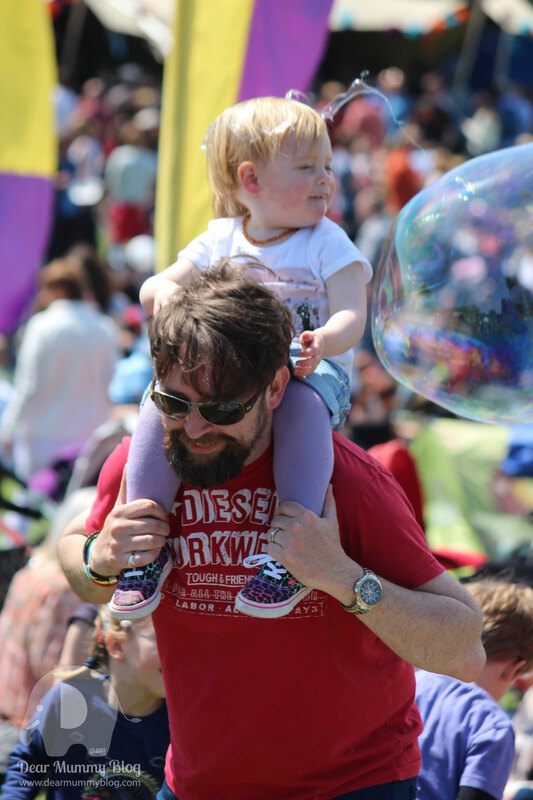 We loved watching the giant bubbles, against the backdrop of the blue sunny sky. It was quite a crowd pleaser, and even though it was busy it never felt like chaos. 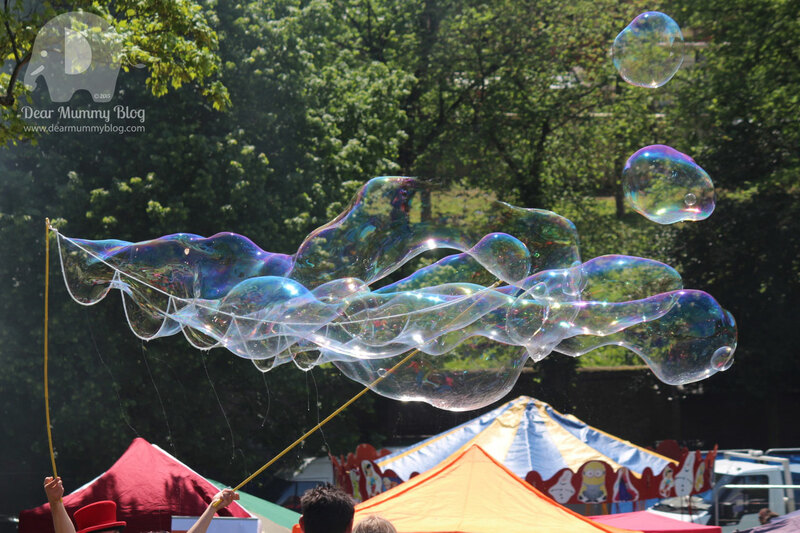 I even had a giant bubble pop on my head! 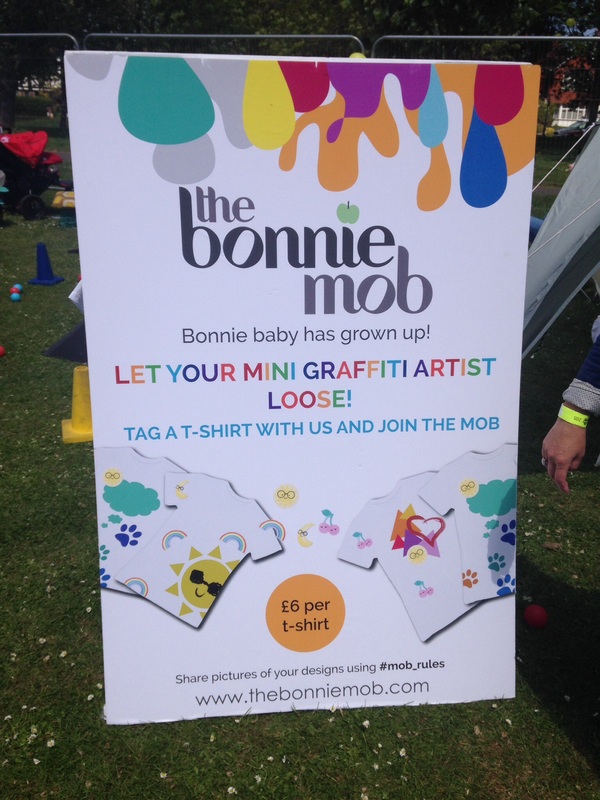 We enjoyed creating a work of art over at Bonnie Mob (Bonnie Baby London’s) stand. 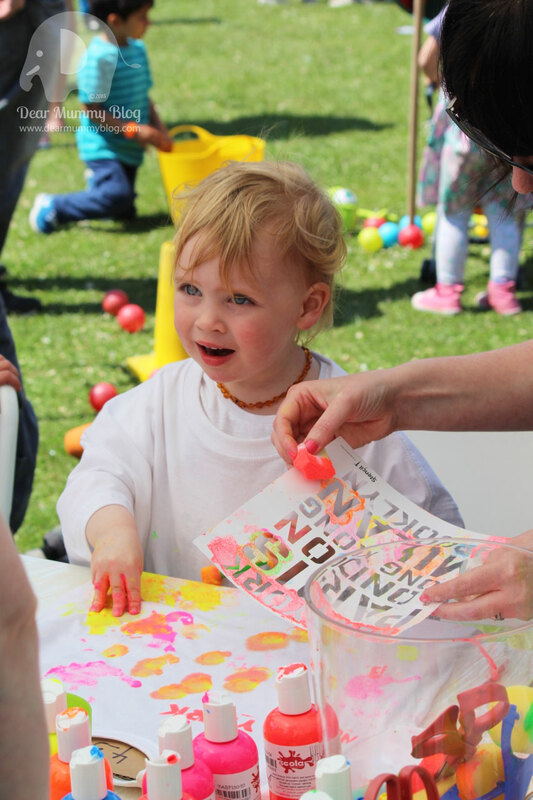 For £6, we used fabric paint in neon colours to decorate a t-shirt to take home. This was great fun and with a little help from my mummy, we used stencils to embellish my creation. I loved painting my hands and imprinting them on the white fabric. Their marquee shielded us from the hot sun which was also a blessing in the heat of the day. I loved the toy stroller test park, where Pimp My Stroller had demonstration models of their quirky toy strollers out for children to play with. I waited patiently for one to come available. When it was my turn I went round in circles over ramps pushing a toy stroller while other children used it as a speedway! A great idea, shame they didn’t have more out to play with as the stand was quite popular with a lot of children waiting for their turn. We’d never seen anything like it. These toy strollers are really funky!! Storytime, was another great activity and it allowed me to wind down before our trip home. 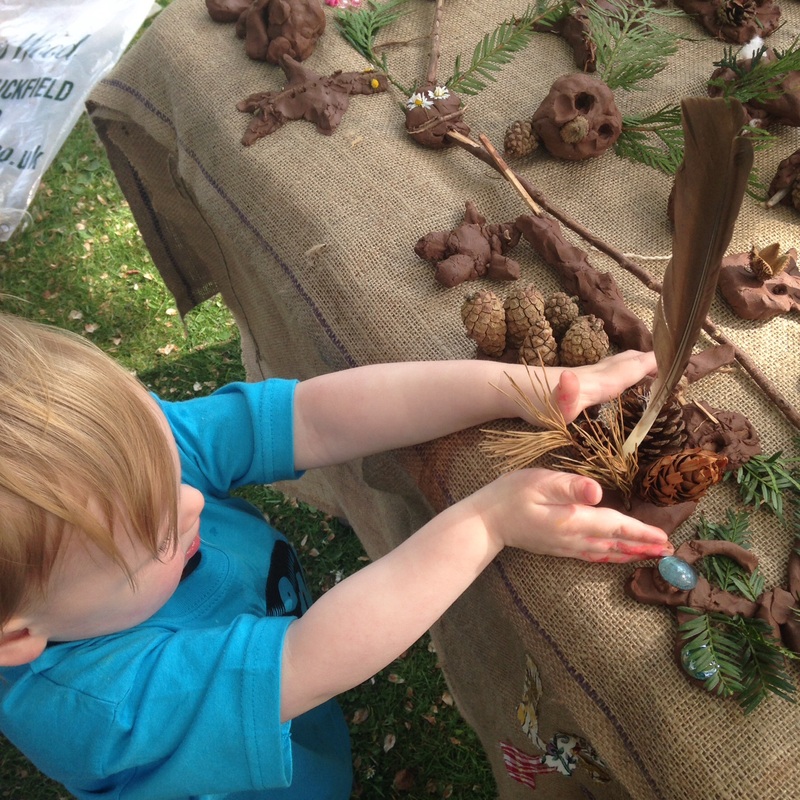 I loved hearing about the Walnut Tree and was mesmerised by the story-teller. 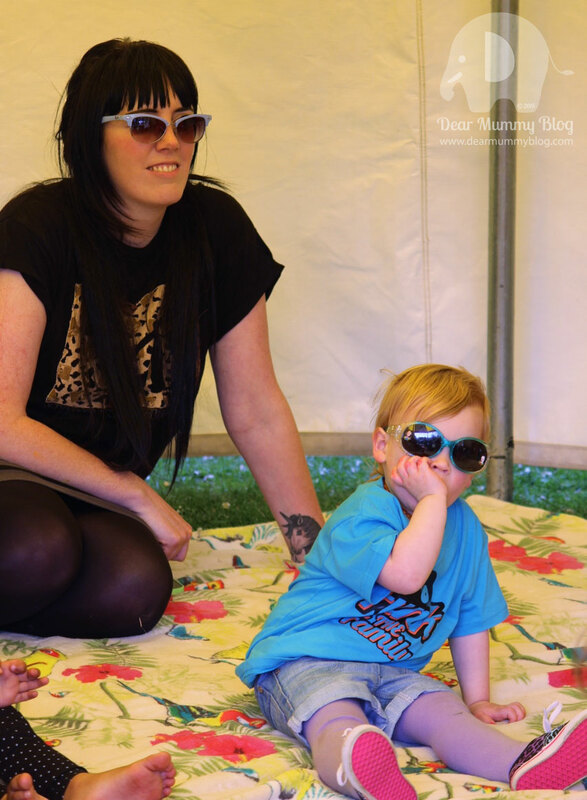 Along with the disco tent, the circus tent and the messy play area, it was enough to keep the little ones amused. 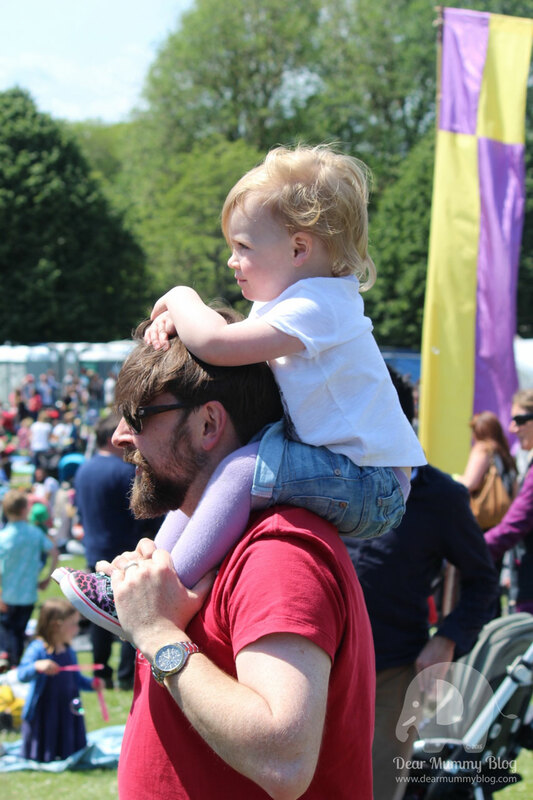 A lot of the children were content just to watch the bands perform on the main stage and have a good boogie. We watched a lot of children roll down the grassy banks and play chase too. They weather was a blessing as it was perfect weather for being outdoors, we don’t know how it would have worked if it had been chucking it down with rain, as there was a lot of open space and not much cover. 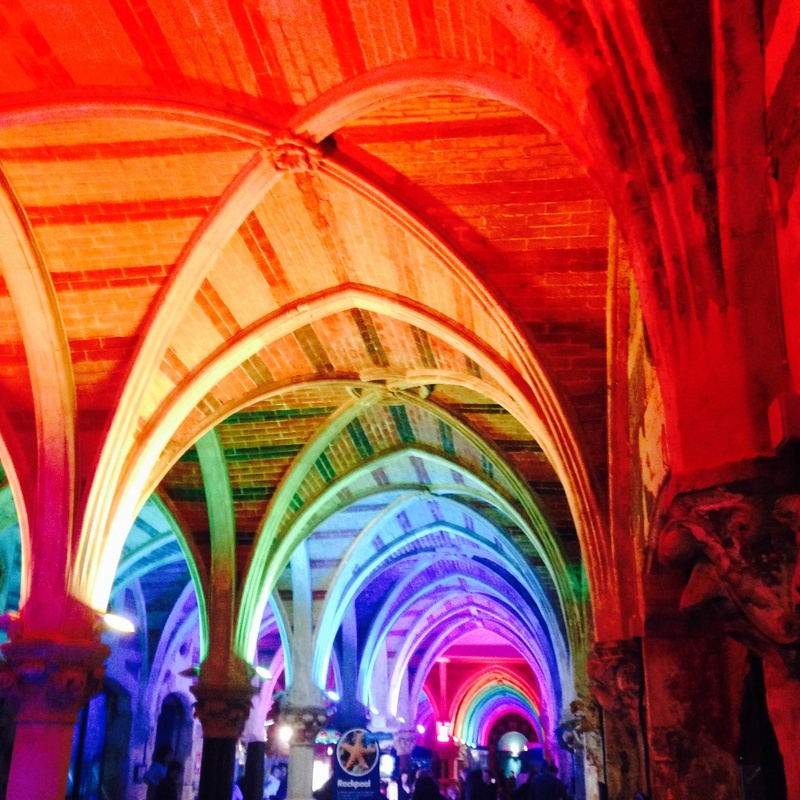 The circus tent, Cirque Du Funk, was heaving, so we didn’t manage to see a show. We opted to watch older children learn how to swing from the trapeze outside as part of the Circus Project. This was a shame and maybe next time they could have more seating or a bigger circus tent to fit everyone in. It proved to be quite popular! In the end we headed back to the festival entrance where there was plenty of green space opposite the Club Tropicana DJ Bar and Disco. We spent the last hour here chilling out. Daddy enjoyed listening to the DJ’s while he queued for cocktails, however they could have done with an extra person helping to serve drinks as two people weren’t enough to keep up with the demand at the Club Tropicana DJ Bar. He was there for 20 minutes which could have been spent dancing with me! 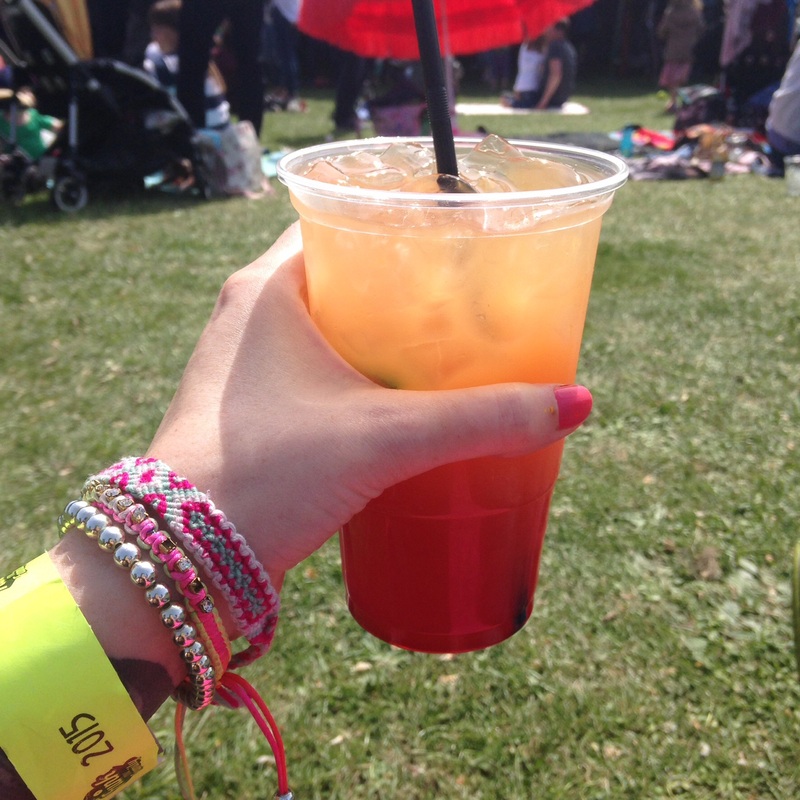 £8 a cocktail was to be expected at a festival, however we observed that some festival goers had snuck bottles of wine in! Cheeky! 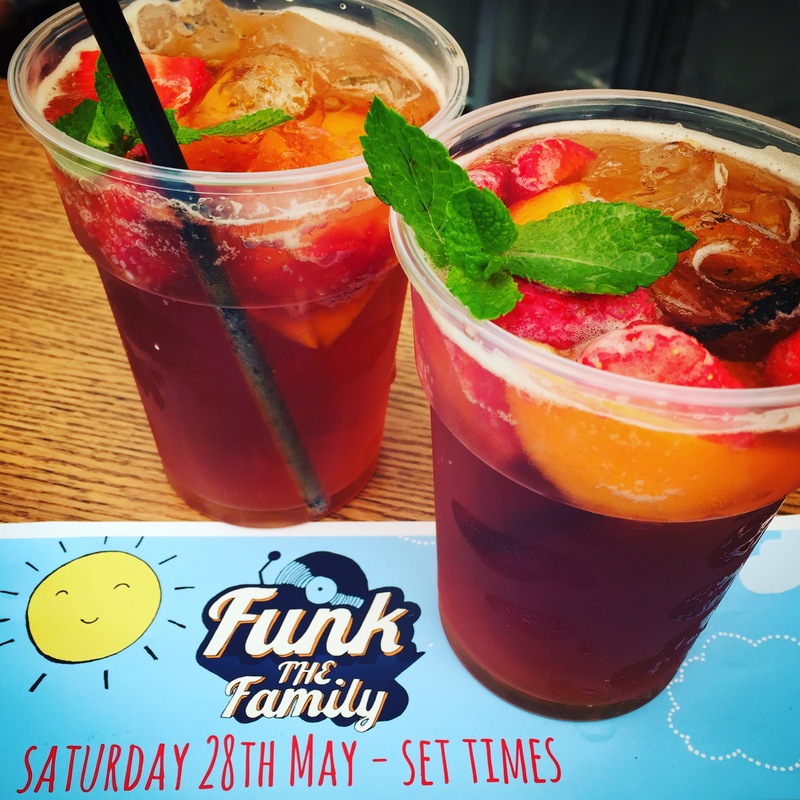 Funk the Family’s toilet facilities were good and even at 5pm they weren’t too stinky. More larger family portaloos would have been good. We loved that they had a separate quiet area for breastfeeding and nursing. The Tree of Life’s well-being zone was great with opportunities to try Yoga for free, a cheap massage and get good health advice. They could have done with more bins around the site for general waste as we carried a lot of our rubbish home with us as we couldn’t see anywhere to put it. Lots of recycling bins around though which is always good. A great day out! 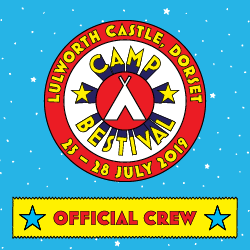 We’d recommend this family friendly festival to anyone, with or without children. The music was eclectic and fresh and really showcased the local talent. The setting was perfect, right in the heart of the community. 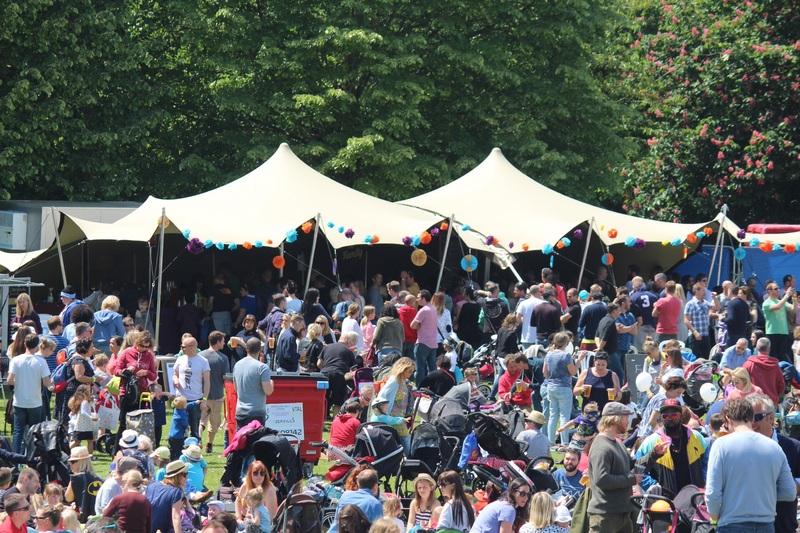 A lovely local festival. Dear mummy, Black Friday has begun! Typing fingers and shopping bags at the ready! Now is the perfect time to grab yourself a bargain before Christmas. 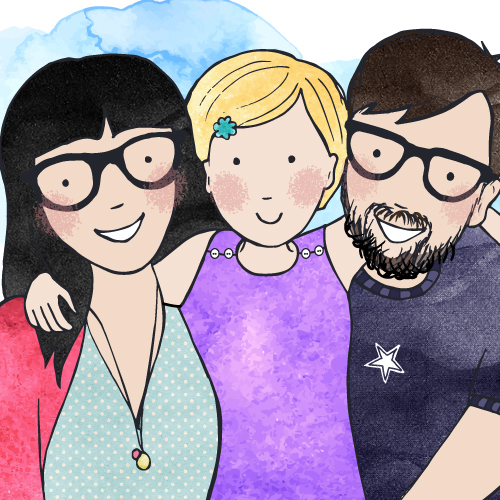 As you know from previous posts we’re big fans (no…HUGE fans) of UK small businesses. We love to buy and help promote the best of British, especially well designed and sought after fashion. Black Friday gives us the excuse to buy in bulk as we save so much on discount that we really can afford to buy high quality items. 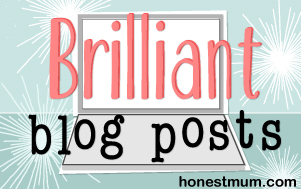 We’ve tried and tested our favourite brand BonnieBaby UK for over a year now, some of the clothes my mummy bought for me over a year ago in the sales!! They still fit and have lasted multiple washes and crazy outdoor antics. 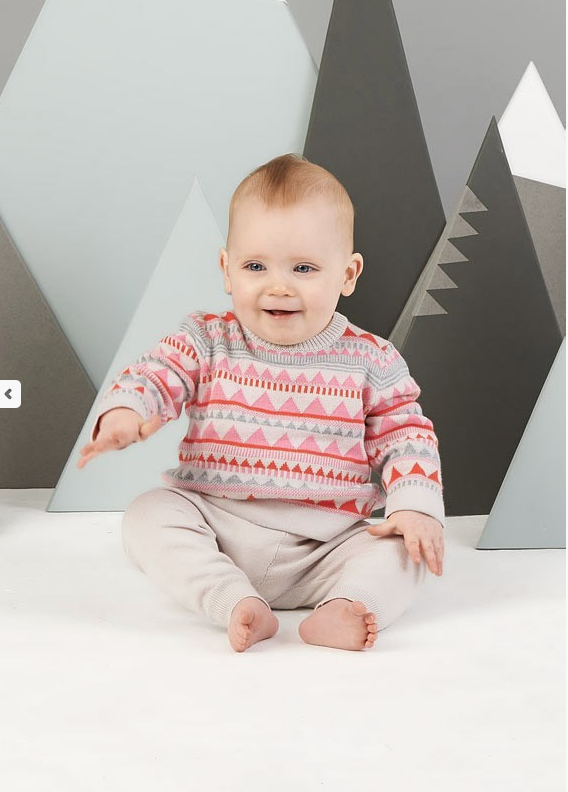 This week, my mummy has finally got round to ordering me some of my favourite key pieces from the A/W14 collection from Bonnie Baby UK. You see, I offered to help model some of their clothes earlier in the year to help showcase this Brighton based brand. 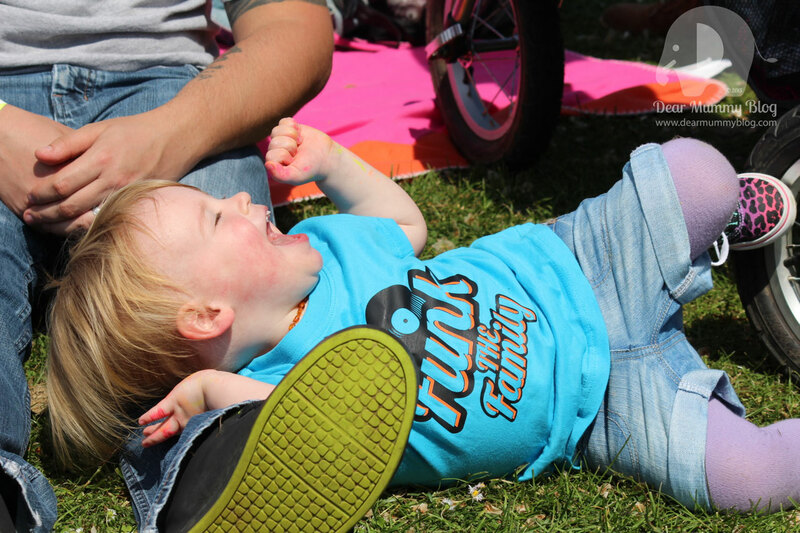 Go grab yourself a bargain from this luxurious childrenswear brand. The #Blackfriday discount only runs until Monday 1st December 2014! 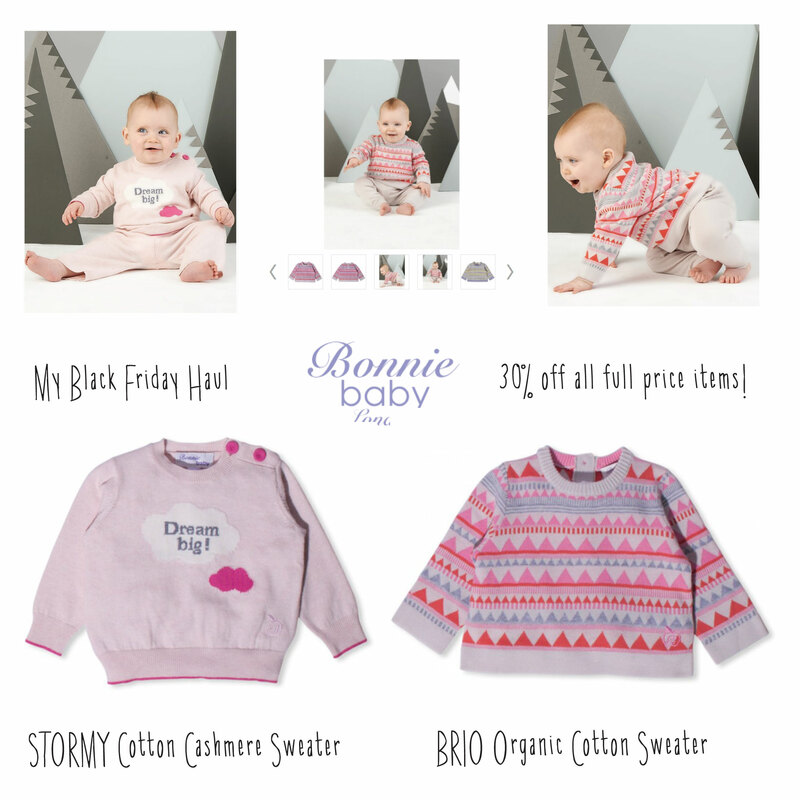 Here’s what I bought from Bonnie Baby’s UK Black Friday sale, perfect for Winter! How is it that I always sleep when daddy drives us down the M25? A good thing considering our journey to Brighton is quite long. The traffic isn’t too bad as we head early in the morning and by the time we get to Brighton the sun is out but it is VERY windy. Mummy and Daddy are using their anoraks as wind parachutes as we duck in between the lanes towards the seafront. I screw my face up as the wind hits it, luckily we see the pier and the giant wheel and know that we are nearly there. Brighton SEA LIFE centre sits right next to Brighton Pier and is a busy spot for tourists. 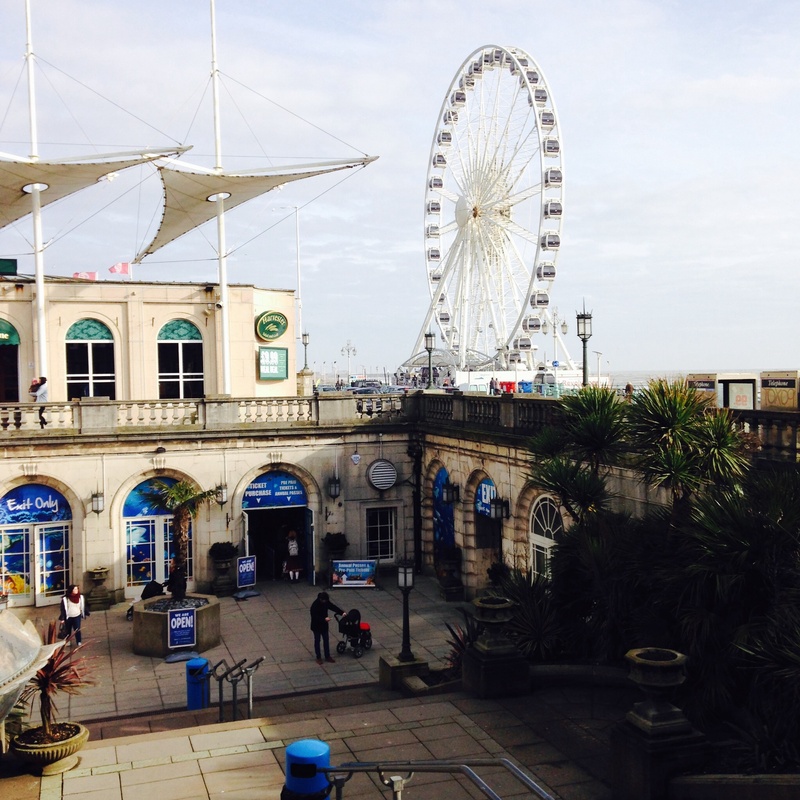 It used to be called Brighton Aquarium and was built in 1872 and is the oldest operating aquarium in the WORLD! Woweee this place is old! Like a museum for fishys! The SEA LIFE Centre took ownership of it in 1990, and because of their stance on conservation, research and their breeding program they rehabilitated and relased two trapped dolphins called Missie and Silver who were performing there before SEA LIFE took over. It’s a very educational visit, even for someone as small as me. I like looking at all the pretty colours in the Victorian Arcade where I saw a Thornback Ray and touched a StarFish at the Rockpool 🙂 Seeing all the fish float past us is truly a wonderful experience and I spend my time trying to catch them through the thick glass. We left our pushchair at the buggy park in the entrance. While mummy changed me daddy had a look in the educational room where he found out more about the SEA LIFE Conservation Trust. 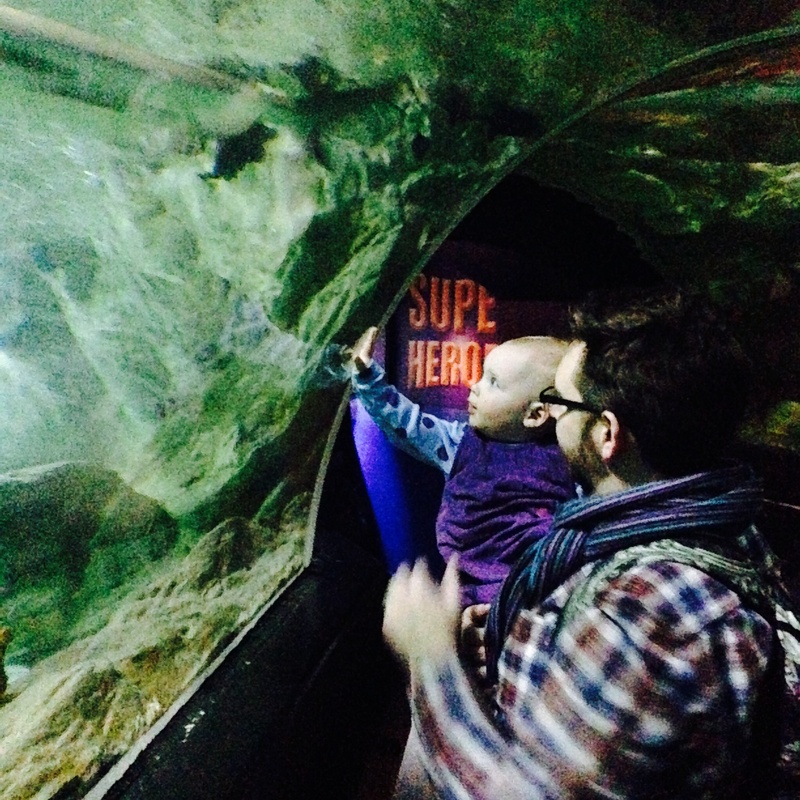 We went to see the Octopus Garden which was a new feature introduced last year. 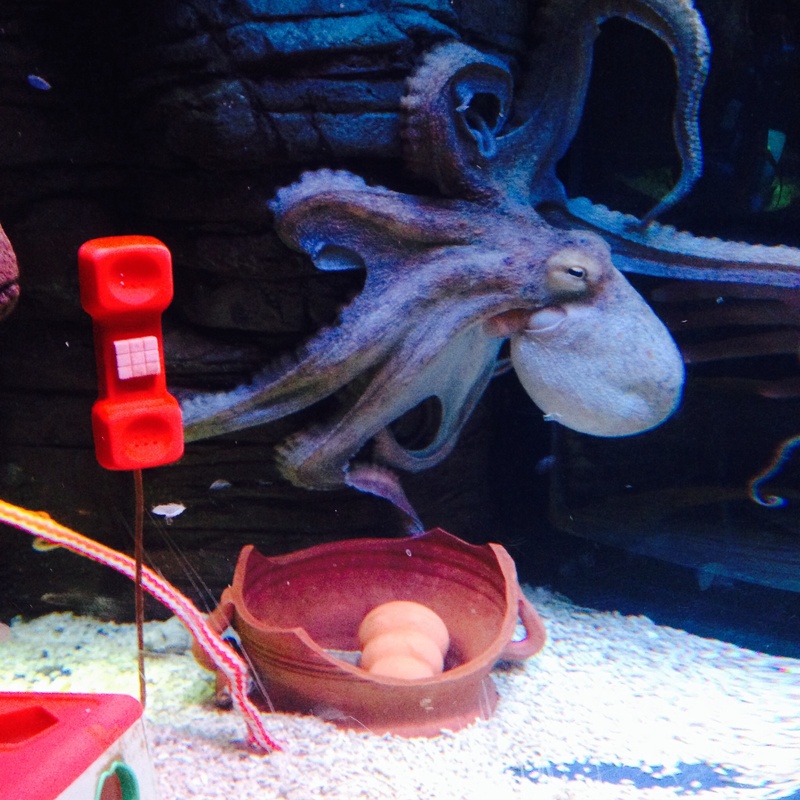 These creatures looked very funny and I was fascinated by the large Giant Pacific Octopus making calls to home! It reminding my mummy of ET phoning home…. Right in the centre of the Victorian Arcade is the cafe where we stopped for a bite to eat. While I was eating so were the Rays behind us as it was there feeding time too. The SEA LIFE staff were very knowledgable and friendly explaining the orgins of all the marine wildlife. 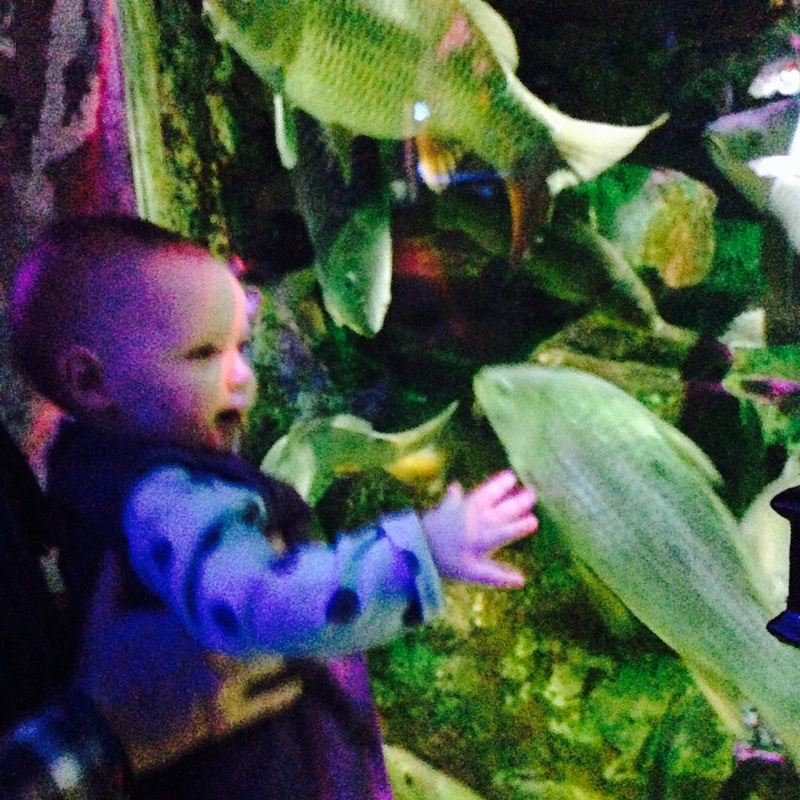 Even though it was busy, watching the fishes was a very calming experience. The best part for me was the Ocean Tunnel underneath the Ocean Tank and Auditorium, we were very lucky as the crowds hadn’t yet gathered there so it was quiet and we spent a great deal of time in there watching sharks and sea turtles swim past. The only thing we didn’t do was the Glass Bottom Boat as I was a bit young for that and mummy and daddy wanted to give me something to look forward to for our next visit to Brighton. 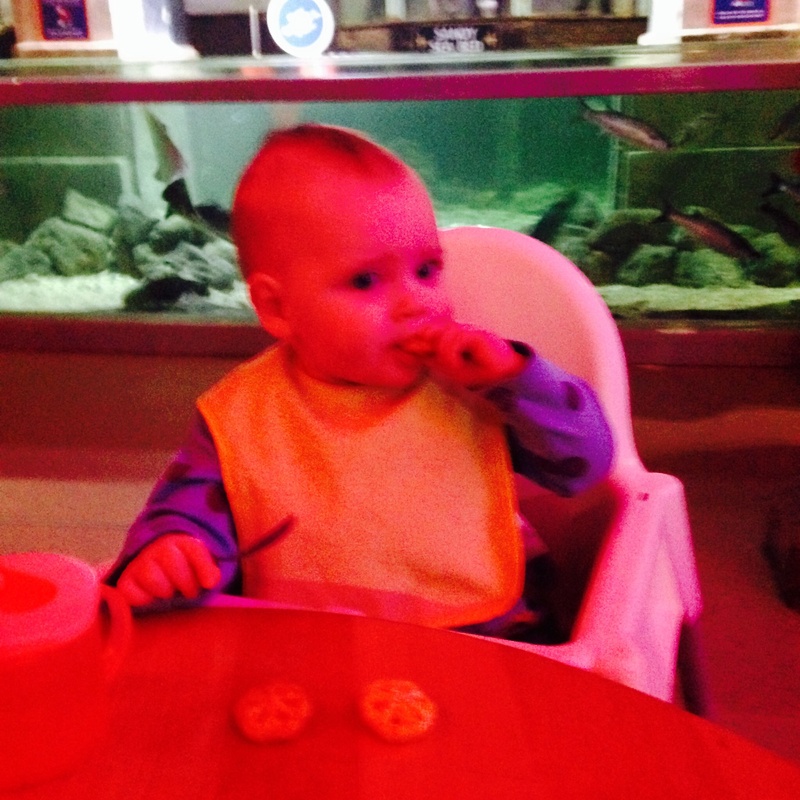 Mummys favourite room was the Kingdom of the Seahorse. She loves Seahorses and I can see why! there are nearly 50 species of Seahorse, from the smallest at 1cm to the largest called the Big Belly Seahorse at 30 times bigger! 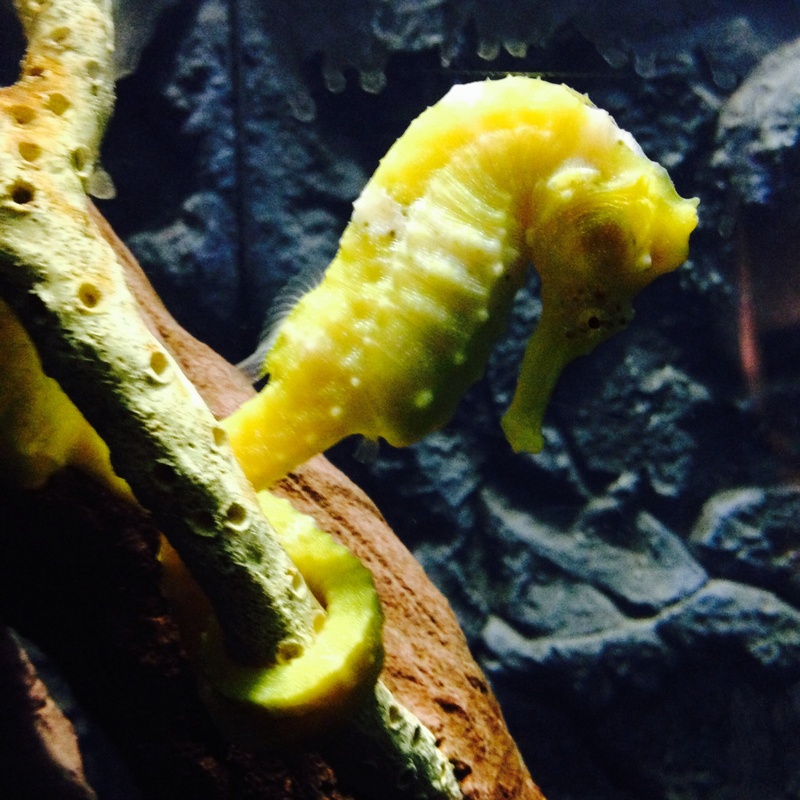 Interesting fact – The Latin for Seahorse is Hippocampus which means Horse Monster! We only saw a couple. Mummy was especially taken with the Pacific Seahorse who was sleeping and had attached himself to a bit of coral. He was very brightly coloured! Carrying me started to become hard work and mummy and daddy’s arms were aching so mummy carried me in her Pouchlings Mei Tai for the remainder of the visit which was great as I could see better and was at adult height looking into all of the tanks. Mummy gave daddy a mental high five for this as I was getting tired and it gave me a rest so they could continue enjoying all the sights of the Aquarium. We spent 2 hours in there completing my Log Dive Book full of stamps of my discoveries. This log book is a lovely keepsake to help me remember the days adventure and inspired me and my parents to take a closer look at Marine wildlife and conservation. 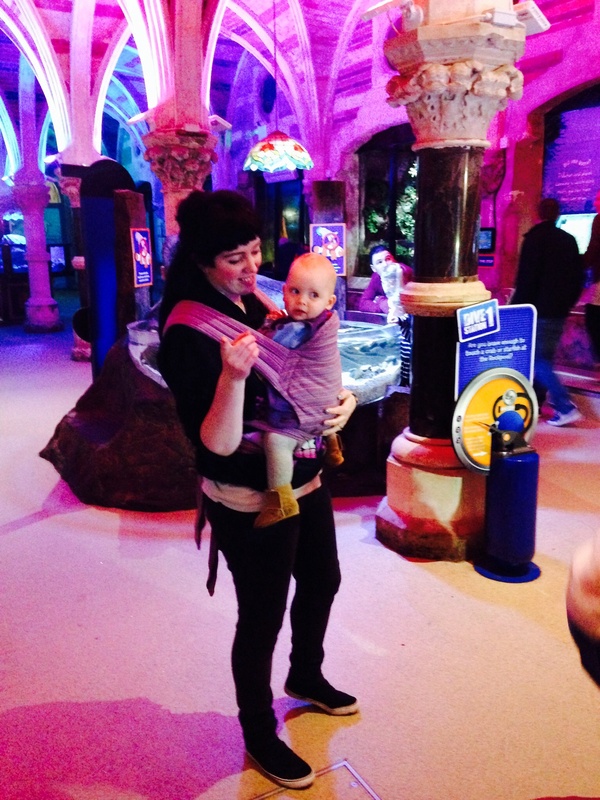 The ‘Five things to do at home’ part of the Guidebook was very eye-opening and informative and we would recommend a visit to SEALIFE Brighton to anyone! 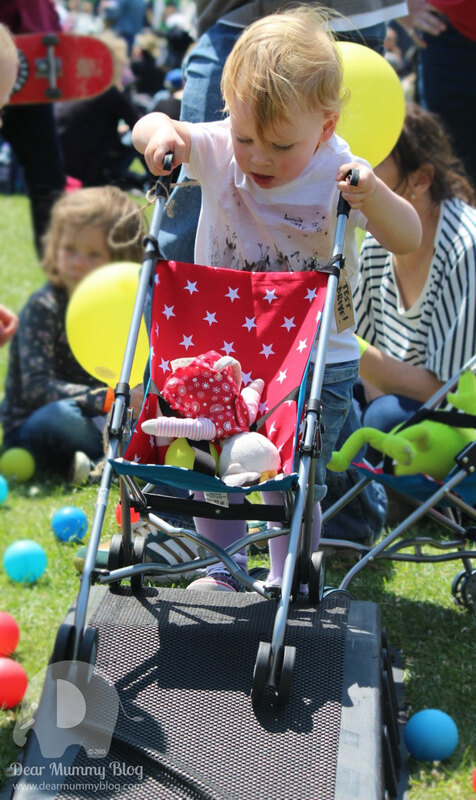 There are so many activities for children to take part in and so many things to see… That’s why we will be going back for many years to come.